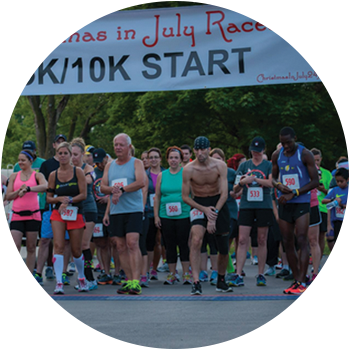 The Christmas in July Races will take place in various communities. 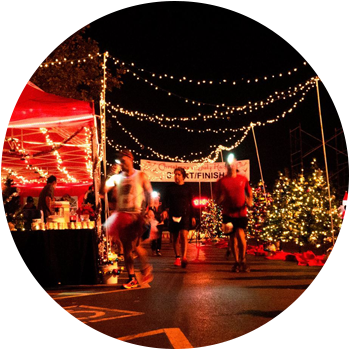 These races may be held in the evening or daylight hours depending on the location and venue, and may include Distance races, Timed Races, or Kid Santa Fun Runs, depending on the location. This is a great venue for the entire family. Surely no one would mind if Santa showed up so early this year that he was wearing shorts, and even sweating a little. So much the better if it gave us all an excuse to dress up and get into the holiday spirit just a few days in July. Ho! Ho! Ho! Fun and Festive! 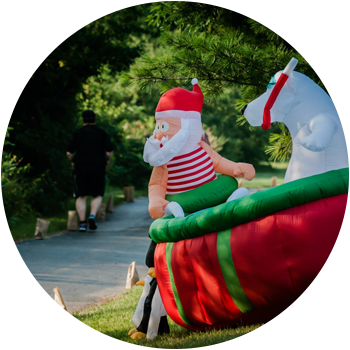 The races will be decorated with a Christmas theme and we will decorate differently depending on the venue, time of day, and type of event. 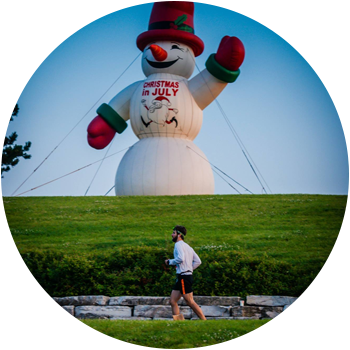 For instance, in Lisle, we have over 2 miles of Christmas lights, 20-30 Christmas Trees, over 25 inflatable decorations placed around the course, a couple 25-foot tall festive inflatables holding ground in premier locations, and more. Swag-i-li-cious!!! You Get It Here!!! On top of the great finisher awards (medals for everyone), runners will receive a tech-shirts. The Ultra and Timed event runners will also receive an additional SWAG item TBD based on venue. 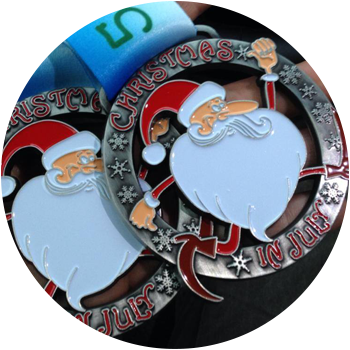 Cross the finish line and we'll hang an AWESOME finisher's medal around your neck. Show it off to your friends in the following days. Heck, maybe you'll want to hang it on your Christmas tree this year for added decor. 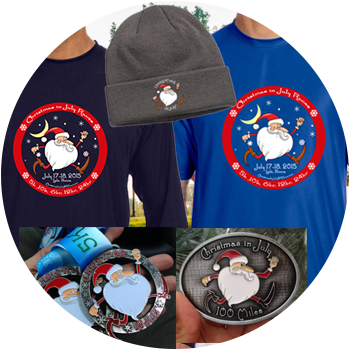 For those of you endurance nuts who like to run far, if you make to 100 miles within your race's time frame we'll be happy to award you with a hard earned belt buckle made special by Santa's helpers. Unique Awards! How About a Nutcracker? Yes, Please! Get training because you won't want to miss out on winning one of these guys. 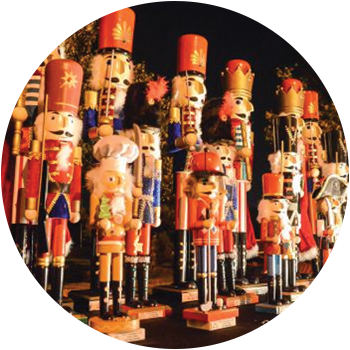 Unique Nutcracker awards will be awarded to everyone who wins their age group category, which are in 10-year age brackets for the distance races (Under 20, 20-29, 30-39, 40-49, 50-59, 60-69, and 70 and over). Those fast runners enduring our timed events, we will also award those who place in the Top 3 of the Open and Masters categories. Costume Contest! Bring the Fun! Getting out, being active, and having fun is what it's all about. What's more fun than dressing up red or green socks with a Christmas dress, Elf outfit, or ugly sweater. 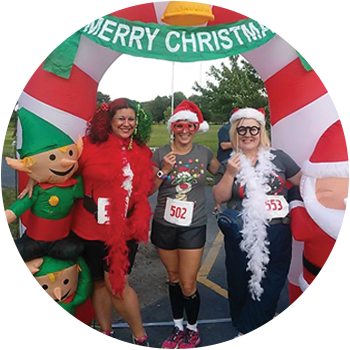 Get creative, bring your friends, join the fun and compete in the distance events or timed events as a whole for the best costume nutcracker award. We look forward to seeing all the fun ideas you come up with. Family Photo or Selfie at Photo Booth! Everyone loves a fun picture to share with friends to let them know that they're missing out. Snap a group picture or take a selfie in front of any one of the number of inflatable decorations with some props that we'll provide on our photo booth table. If Santa is around, grab him for some extra holiday cheer! 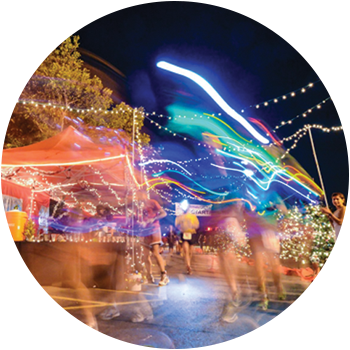 You will generally be running on a USATF certified route (depends on venue). Details about each course will be found on the event page. Most of the decorations at the race are around start and finish area. We will have some decorations out on the course and aid station(s). You can expect to see inflatables, tree lights, Christmas trees, etc. at the race. All of our races will be chip timed to provide you with pin-point accuracy between the time you start your race and when you finish; however, for our serious runners who are trying to break records, we advise that you move up to the front of the starting line so that the USATF gun time rules play in your favor; otherwise, you may lose a few seconds from the gun time. We Reward For Coming Back!!! Quite simply, if you come back, you're having fun and that's what we want. 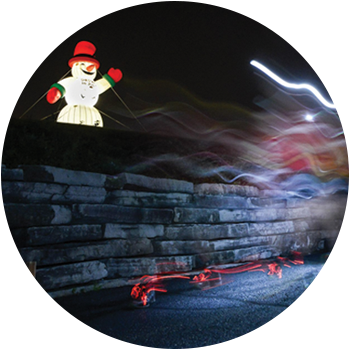 We want to build a following of runners like you that will share in the magic we are trying to create. In return we are going to reward you with something above and beyond what most other races provide. We have a Loyalty Program for runners who return to run our races at least five (5) times. Runners 4 Wellness, LLC was founded in 2013 by Brian Gaines, Ed Kelly and Terry Madl to help foster active, healthy lifestyles. Our intent is to promote holistic wellness within communities.